The Woman's Opportunity Award is a scholarship given for women seeking to improve their economic status by gaining skills, training, and education. Our 2012 Club winner was Janel Lajoie. She is a single mother raising four boys who has returned to college to earn a degree in Environmental Studies and land conservation. Janel attended a presentation luncheon at the May 2nd SINV meeting to recieve her award, a check for $3000 and tell her inspirational story. 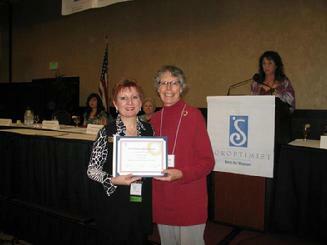 At the Regional Meeting April 27-29th Club member Christine Reisling accepted the The Regional WOA Award for Janel.